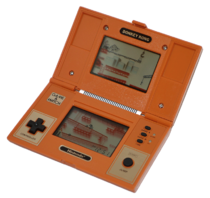 The Game & Watch is a series of self-contained handheld LCD games by Nintendo where the first one was released on April 28, 1980 and which are often seen as the precursor to the Game Boy/Color, although new Game & Watch games were still released as late as 1991. Despite their simplicity, Game & Watch handhelds were completely unemulated for a very long time due to a lack of information about their hardware and difficulties with dumping ROMs and accurately recreating graphics. After an extensive reverse engineering effort by several MAME developers, MAME became the first emulator to support many retro handheld electronic games, including Game & Watch systems. It was officially the 1st Game & Watch emulator, with support for a growing number of games (An example being Mickey and Donald). It started to comprehensively cover the Game & Watch games from around just before mid-2017 (e.g. 0.185 in May 2017) and emulated its first game in 0.186. For the games it does support, MAME is recommended, although many Game & Watch games still can only be played outside of the original hardware through simulation. See MAME driver which covers several of the Game & Watch series of games and those of a similar ilk from other companies running on the LCD game handhelds with Sharp SM5xx family of CPUs (SM510/SM500/SM5A/SM512) (Other companies that released similar games included Konami, Elektronika, Tiger Electronics, Tronica and VTech). Arcade Italia's database of compatibility records for games on MAME. It was officially the 2nd Game & Watch emulator. Just before mid-June 2017, also it started to emulate a few notable Game & Watch "Thanks to MAME for the ROMs and the info." (as stated in the readme). Although Game & Watch emulation has recently become possible, it took quite a while to achieve due to the lack of information about the microcontrollers driving them and the high difficulty of dumping the ROM from a system. (To dump a game's ROM, the microcontroller often must be decapped, which is not only very costly and complicated but highly destructive to the system.) The lack of information on the Game & Watch's hardware leads to the false belief that it does not contain a CPU or ROM and therefore could not be emulated. Even though this was disproven after reverse engineering efforts of several MAME developers led to support for a few games being added to MAME, emulation of additional games is progressing slowly due to the high amount of time and patience it takes to dump their ROMs and recreate their graphics. Even when a Game & Watch game's ROM has been dumped, one of the biggest challenges with accurately emulating it is with how the Game & Watch displayed graphics. Rather than by sending output to an LCD display like most cartridge based handhelds do, Game & Watch games (as well as most other handheld electronic games from the same time) displayed graphics by lighting up pre-drawn LCD segments, like a calculator. In order to recreate this as accurately as possible, MAME uses .SVG files traced from high-quality scans of the LCD screen, allowing graphics in supported Game & Watch games to be displayed crisply at any resolution without the loss of any detail. While this is the most accurate way to recreate the LCD graphics outside of obtaining the original art from Nintendo, it is a difficult and time consuming process, as not only does the LCD need to be scanned at a high resolution with all segments lit up to capture all of the graphics, but the scans must be traced very carefully to faithfully recreate the original artwork. For a lot of Game & Watch games, this is your only option outside of buying them used. Nintendo officially released virtual reproductions in the games and compiled them in the Game & Watch Gallery (and, later, Game & Watch Collection) series of games. These games had both "classic" and "modern" variations of these games. While these collections have a loss of "authenticity" (especially in the collections that are running on earlier hardware), these collections are Game Boy, Game Boy Color, Game Boy Advance, and Nintendo DS games for which emulators are widespread. (A few games are from the difficult-to-pirate DSiWare series, though every game in the DSiWare series appears in another collection.) However, some of the games in the collection (notably Zelda) may need to be unlocked before play. Pica Pic (by Hipopotam) is an online collection of Game & Watch games under an authentic presentation. While there seems to be no way to play these games offline, there are a few games that are exclusive to the website. Madrigal wrote some simulations that give an offline, authentic presentation of the Game & Watch games, the collection of these games growing through time. Of particular note is that these are available to play through RetroArch through the gw-libretro core. There are also some that are not of the Game & Watch series. From an emulation point of view, the 2009 re-release of Ball is a completely new game with a different CPU and a different program compared to the original Ball release. This page was last edited on 13 April 2019, at 17:07.